Depression feels like a dark fog that never lifts. It obscures the simple pleasures of life, limits our relationships, and impedes us from fulfilling goals and aspirations that can bring us joy, fulfilment and meaning. Getting past the black clouds that disrupt our lives is no easy task. Depression and anxiety are not conditions that can easily be brushed away. Conventional pharmaceuticals have a surprisingly poor record track record of helping people (especially over the long-term) and they are not without serious side-effects. However, there are substantiated natural ways of improving your mood that can help you move beyond despondency, gloom, and distress. Many of these remedies take time to kick in, but because they address underlying hormonal, digestive, and neurological imbalances they can ultimately help put you on a much firmer physical and psychological foundation. Depression can be a natural reaction to life events, but it is not the body’s natural state. Mood is regulated by a number of biological processes and activities. Critical factors include the endocannabinoid system (which governs homeostasis) through the regulation of hormonal signals and the activation of neurotransmitters. The body naturally aims at balance (homeostasis) and a depressed mood is invariably an indication that something is out of whack. External triggers (such as the death of a loved one) can cause profound biological changes, but so can inflammation, bacterial infections, poor nutrition, and other factors that might interfere with the body’s biological activities that aim at balance. Natural antidepressant remedies aim to restore the healthy functioning of the underlying mechanisms that are responsible for maintaining your mental and physical equilibrium. 1. Foods with omega-3 fatty acids. Omega-3 fatty acids are concentrated in the brain and scientists believe they play a very important role when it comes to cognitive performance, memory, and the production of receptors for the feel-good neurotransmitter serotonin. Studies have found that omega-3 fatty acids are linked to better brain health and lower rates of depression. Indeed, some research suggests that omega-3 supplements are at least as effective as conventional antidepressants. Excellent sources include wild salmon, walnuts, and hemp seeds. 2. St. John’s Wort is a medicinal plant that has been used for centuries to counteract depression. Scientists believe that compounds in the plant (especially hypericin) help the brain make more of the mood-elevating neurotransmitters like dopamine, serotonin, and noradrenaline. 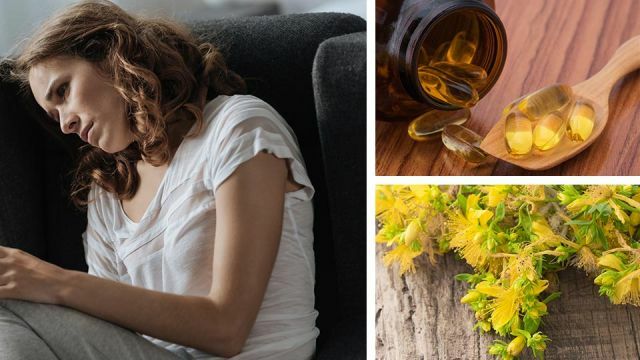 Studies indicate that St. John’s Wort is just as effective as conventional tricyclic medications but without any of the distasteful side-effects. 3. Low dose CBD oil. Scientists are only beginning to discover the centrality that the endocannabinoid system plays in regulating mood and homeostasis. Compounds in cannabis, most notably cannabinoids called THC and CBD, have been shown to modulate (and perhaps compensate for impairments or deficiencies) in the body’s endocannabinoid system. THC has been known to induce paranoia in some users, which may be why marijuana has mixed results when it comes to treating depression. However, preliminary research suggests that CBD oil (which is not psychoactive or mind-altering, but which is responsible for marijuana’s relaxing qualities) can help alleviate depression and anxiety. Most experts seem to agree that low-doses of CBD oil appear to be the most effective. 4. Get probiotics. Most people don’t appreciate “the gut-brain connection. The neurotransmitter serotonin is inextricably associate with your grey matter, but how many people know that 90 percent of the body’s serotonin is actually manufactured in the digestive tract? Bad bacteria in your digestive system can cause a host of problems including inadequate nutrient absorption, poor blood glucose management, and chronic inflammation. All these conditions can end up impairing your cognitive health, which will inevitably sap your mood. Getting probiotics from yogurt, kefir, or fermented vegetables (like sauerkraut) can help improve the health of the flora in your digestive system. More research is needed, but some studies have found that probiotic supplements are effective in reducing depression. 5. Vitamin D3. Deficiencies in vitamin D3 (the sunshine nutrient) have long been linked to Seasonal Affective Disorder. Technically speaking, D3 isn’t really a vitamin but rather a hormone that our skin manufactures in response to sunlight. Nevertheless, it’s a nutrient that plays a critical role in many brain functions, which may explain why sunlamps and D3 supplements are often prescribed to alleviate mild and moderate depression. There are many other important things you can do to alleviate depression. Physical activity, avoiding excessive sugar, and eating a plant-based diet can improve your mood. In particular, many alternative physicians believe that inflammation is the root cause of many diseases (including depression). Therefore, eating a wide variety of raw fruits and vegetables (instead of processed foods) can help fight inflammation that may play a role in mood disorders. If you find yourself trying to avoid meat, however, be sure to get take a vitamin B supplement since it’s hard to get enough of this depression-fighting nutrient from plant foods alone. Hey Buddy!, I found this information for you: "5 Safe And Effective Home Remedies For Depression". Here is the website link: https://www.thealternativedaily.com/5-safe-effective-home-remedies-depression/. Thank you.